e health care here and at about 6 other islands (around 1800 people altogether) and found her with a whistle around her neck left over from her athletic event with the children that morning. Part of her health program is to get the kids out every morning to do some kind of sport. I also learned the expression for no smoking in Tongan at the health center: Tapu Ifi Tapaka. Our stay in this group of islands was short and sweet because we were on a schedule to arrive in the capital in time for the big “end of the season” party. As luck would have it, the party was scheduled for my birthday and it is also called a “birthday” party for the resort that hosts it—its 7th birthday. 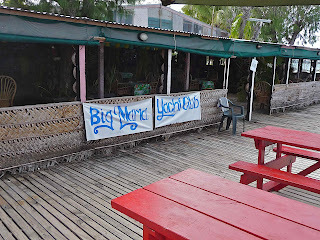 The resort is called Big Mama’s Resort on a little island called Pangaimotu. When I e-mailed to RSVP our attendance I mentioned that the day was my birthday and was promptly e-mailed back that Big Mama’s chef wanted to bake me a cake. Wow, what fun. arrived in front of us and our drink orders were filled. WOW! To cap the whole thing off, Big Mama had made a cake for her resort’s birthday and another cake for mine— chocolate because that’s the only type she likes. A woman after my own heart! 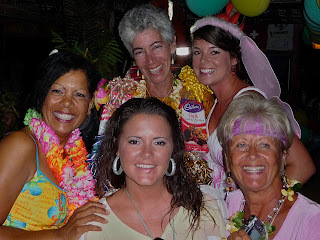 As more speeches were made, a group of my girlfriends from this cruising season came up and presented me with their birthday gift: a lei of giant chocolate bars purchased in town and decorated with ribbon. I was blown away. At last I was free to take off my overskirt and, as there was a live band, we danced until the party ended. 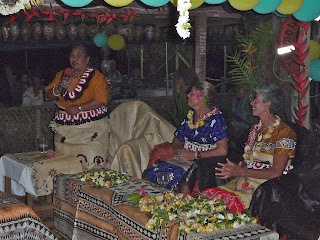 It was a birthday I will long remember.At the birthday party, I met a Tongan woman named Malaia who had lived much of her adult life in the US and had married a US man. 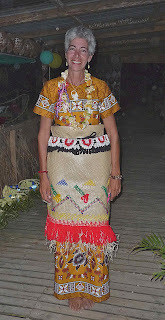 They have since become divorced and her two boys live with him while her daughter has moved back to Tonga with her. She had some amazing stories to tell. She was working for a company as a secretary when they had some embezzlement and fraud issues. Because of her role in the company, her name was on fraudulent documents so she was indicted with the rest of the employees. But, as a green card alien, she became immediately deportable and was considered a foreign detainee. 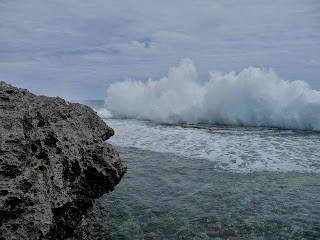 Because her husband and children were living in the US, she opted to go to prison in the US as a detainee rather than be immediately deported to Tonga. She spent 5 years in prison and has written a memoir, I was an Alien to describe her experience which, as she told it to us over the next couple days, sounded pretty deplorable. 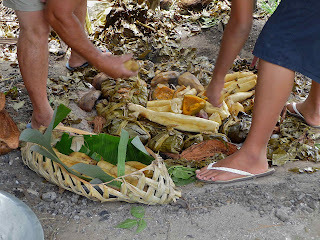 She, for some reason, took to me and invited Richard and me to church and then a traditional Tongan Sunday meal afterward. Our friends from the boat Migration, Bruce and Alene, joined us as well. Malaia brought us to the church in town where the King usually attends although he was out of town and not there, but his mom (the Queen mum) was in attendance. We were seated in an area where the nobles usually sit and listened to, as usual, the beautiful singing and the Methodist service. 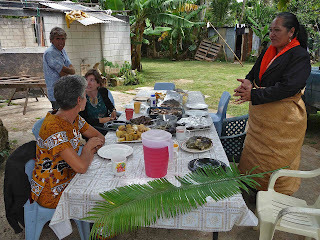 After the service, we went to Malaia’s boyfriend’s house where we enjoyed the Sunday feast of food cooked over the umu (oven in the earth). Her boyfriend was a banker, now retired, who is distantly part of the noble family. Interestingly, his house burned down over a year ago, and, in contradistinction to how any of us would have dealt with that, especially given that he was a banker and clearly of a socioeconomic strata one would expect something different of, his house remained a shell and he was living in some temporary shelters on the property along with his pigs and dogs and many children. He came from a family of 10 kids and he has, I think, 11 children and many grandchildren. We met several of the family members during our lunch. only by their own disorganization. he boat for the next big passage to New Zealand. 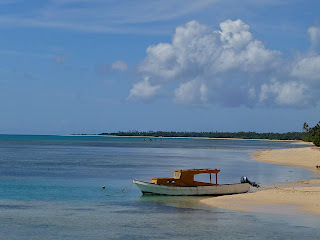 When we finally felt ready enough, we checked out from Tonga. 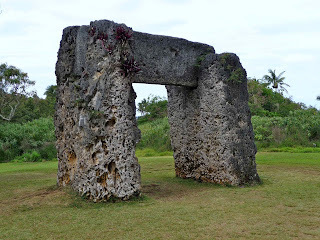 In the end, we spent nearly 2 ½ months in the country and would happily return!